Mimsy: Can schools compete with the Internet by clicking? One of the biggest issues facing brick and mortar higher education is remaining relevant in an age of excess communication. The problem is exacerbated by the tendency to treat college as High School 2.0. Students don’t go to college because they want to; they go because they are expected to, and besides, what else would they do? This combination explains the popularity of tools such as the clicker. They remove the expectation of public participation. Especially, these tools mean that students aren’t expected to engage the instructor and other students in discussions regarding the topic that they took just to fill up a slot in their schedule until they graduate. The instructor talks. The students click. What could be better? There is the feeling of participation without any face-to-face interaction. 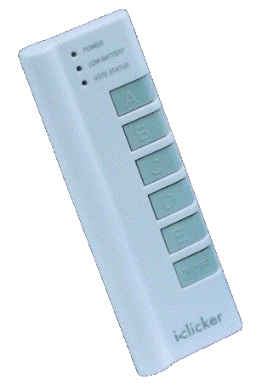 The problem is, once they start using the clicker, why do they need to be in the classroom? Why not click from home? The end result will be something like the scene in Real Genius where more and more students just bring tape recorders to class, and eventually the instructor brings a tape player to deliver the lecture to a bunch of tape recorders. Did scribes after Gutenberg think that they could adapt just by writing faster and in a more uniform manner? Reducing face-to-face communication won’t save the university. Gaze into the Brazil-green future of the university. This is not so much a problem with clickers as what they represent. I would have responded more to questions in college if we’d had clickers, too. But I would have responded even more if we’d had clickers from my apartment. If we use computers to monitor students who are right in front of us, why should students come onto campus to do any of this? What value does a “come to the hill” university environment add to the learning process if it moves to only replicating something that could just as well be done on-line? If universities become nothing more than the Internet with a commute, what’s the point? Which brings me to locked down browsers. 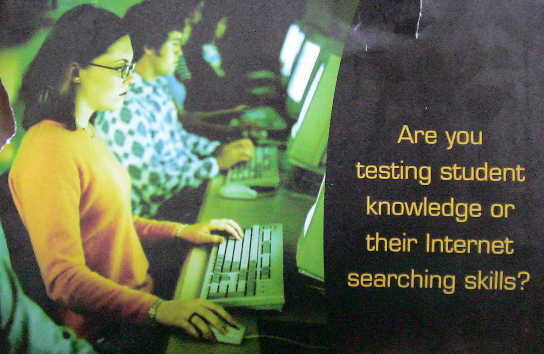 The first time I saw an ad asking “are you testing student knowledge or their Internet searching skills?” I thought the students were taking tests at home. But the ad photo shows a classroom full of computers. Ignore for the moment the pre-iPhone assumption that the school will have control over the browser that students use to cheat. They are using computers to facilitate instruction… and then castrating the computers so that students can’t take advantage of them. It’s like embracing open book tests by saying you can bring in all the books you want—but you can only use them as a writing surface. Because testing should assess rote knowledge of students, not their ability to reason out answers with real-world information. Because the future’s too important to work a part-time job. The concept of “open book” testing when the world is on the desktop opens up the possibility of teaching and testing from a sum of knowledge much greater than a handful of textbooks; for example, testing real-world reasoning under a time-limited environment, an invaluable skill after graduation whatever job they choose. Instead, we fear the possibilities, and look for ways to retain the old information-poor testing environment. But college as High School 2.0 also explains ads that denigrate the old rite-of-passage jobs such as at fast-food restaurants. If students are in college only because, what else would they do?, ads like “supersize her dreams” make more sense. Because why would you take a part-time job at a fast-food restaurant to pay for High School? But most likely, the job they take when they graduate will be because, what else would they do? The rapidly rising popularity of graduate study among undergraduates seems less like a love of learning and more like a failure of undergraduate education to inspire students to want to do something other than stay in school. Remember the days when going out looking for a job meant you might miss the call from another potential employer? If you were born after the eighties, you probably don’t, because you carried your phone with you. You are richer, and more employable, than previous generations, simply because you have access to technology that only rich people had before you were born. Paul Graham has been writing lately about income inequality, and how it’s the wrong metric to measure if we want to reduce poverty. He pointedly says that the only way to reduce income inequality is to reduce the number of startups we have, which will mean reducing jobs and retarding progress—both technological and economic, that is, reducing poverty. Here, he’s in direct opposition to most progressives, who believe that reducing income inequality is more important than reducing poverty. President Obama famously said that he would raise the capital gains tax even if lowering it would increase tax revenues, “for purposes of fairness”. The problem is, progressives don’t like progress. The vast progress made since I was born has greatly increased economic inequality—while at the same time vastly decreasing real poverty. In order to keep government functionaries in business, we’ve had to redefine poverty as something that the poor of past eras would have considered rich. 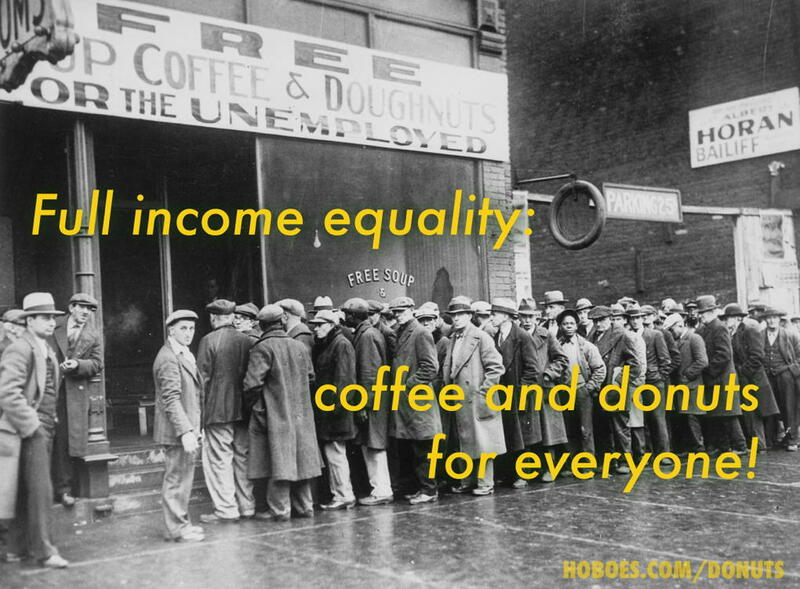 More economic inequality clearly does not mean more poverty. But there’s something else, more an aside, in Paul Graham’s response to Ezra Klein that is even more important. Some measures for decreasing poverty could well increase economic inequality. For example, if you gave every child in America the same quality of education Bill Gates had, that would surely decrease poverty. But you would then create a lot of new Bill Gateses as well. These kids wouldn’t all stop short at middle class. The more ambitious ones would shoot right out the other side. That would be a great problem to have, you say? I think so too. If every child in America had the same education Bill Gates had, economic inequality would go up, and poverty would go way, way down. And what education did Bill Gates—and for that matter, his rival Steve Jobs—have? Doing things. Both Bill Gates and Steve Jobs dropped out of college to do things. That’s how children learn. As Mike Rowe eloquently wrote in his post about the Dixon Ticonderoga, we have confused qualifications with competency. Wealth is grown through competency, and poverty is dispelled by wealth. September 2, 2015: What is a captive audience, anyway? 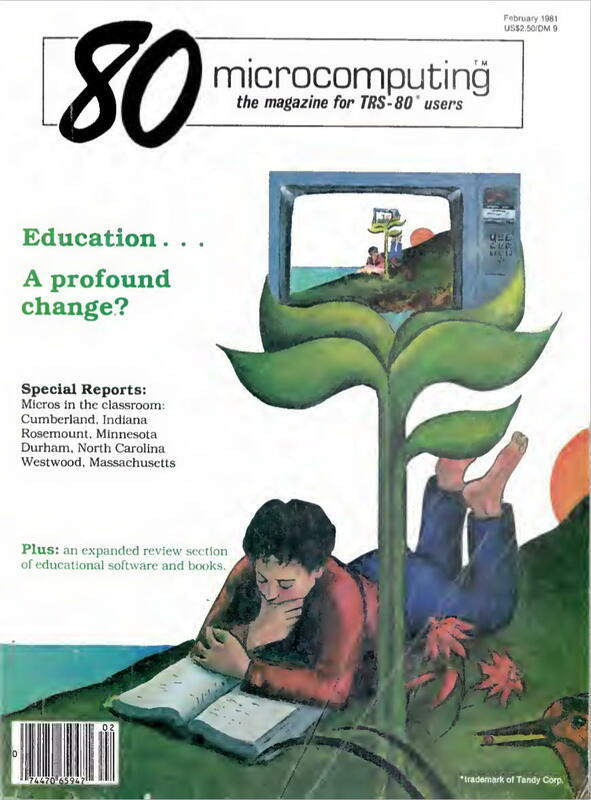 In the October, 1981 issue of 80 Microcomputing, I read a teacher’s union reply to a Wayne Green editorial that had me going into the back issues. My first thought on reading the union official’s reply was, what did Green say this time? He was known for his epic rants. I found it in the May issue. 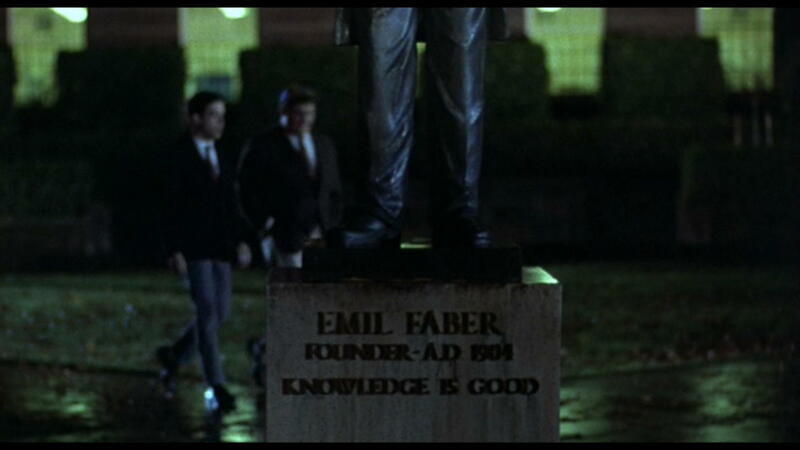 Green had written about the poor state of Erasmus, the school he once attended in Brooklyn. Once “one of the best schools in Brooklyn”, by 1981 it had become “the most dangerous school in New York”, according to an unnamed television program. It takes a special police force to keep crime down to “acceptable” levels. It is an armed camp… At Erasmus teachers have police protection walking around the halls. After the rant, he predicted that computers would ease the burden on schools by moving learning into the home. Perhaps the computer comes to education just in time. Before we can accept the computer we may have to adjust to a fact of life: it is not our responsibility to force-feed education to children. Isn’t it enough that we make it available? We’re a prisoner of our past in much of this. Schools developed for good reasons, but they evolved into giant baby-sitting systems for most families. Summer vacations may have been a blessing for the kids, but many mothers sighed when they came. I believe that eventually we will provide a better quality of education by means of computerized teaching than is currently available in most schools. Truly interesting courses can be taught by some of the best teachers in the world. The computer, as I’ve written before, can control the speed of the teaching process, gearing it to the interest and intelligence of the student. Once we have developed better learning systems, not dependent upon live teachers for other than minor support and advice, it may be possible to move these systems into the home. This may be a healthy change for society and result, in the long run, in more highly motivated children. Government school motto now ‘knowledge is secondary’. Secondary to administrations, secondary to unions, secondary to politicians. I was reading about Oregon’s plan to reform how colleges and universities are paid, and it occurred to me, we’re getting school vouchers whether we want them or not. We’re just applying them to colleges, pretending to make students pay for them, and wasting everyone’s time in the process. I’ve occasionally said that I think people should be forced to live a little for a few years before going into college; I would not be surprised if someday that period is the four years that currently take up high school. If government schools continue to teach less and less there will come a time when people just don’t see the need for it. If the job interviews I take part in are any indication, colleges are already teaching computer programming that could just as easily be taught in high school or with a minimum of self-instruction. I expect it’s the same for other fields. College instruction is no longer even about a passion for learning. We interview computer programming majors who don’t have programming projects, graphics design majors who don’t do their own art, and English majors who don’t read books. It’s as if, in fact, they are taking these courses because they have to—just like high school. Government schools no longer prepare us for jobs. Colleges are having to teach at a high school level to attract customers—because their customers don’t have a high-school level education yet. You might think that the big problem with this trend is that it means people are less and less prepared to go into college, and while that’s a true statement, the big problem is that, the more money the government puts into colleges, the more colleges evolve into government programs—and so they start failing us, too. Can schools compete with the Internet by clicking? last modified February 14th, 2018.